Hello everyone and happy Thursday to you all. Being a Thursday means it's another great challenge over at MAWTT and this week it's Shell's turn to host her first blog here. The sponsor is Foilplay who have lots of scrummy things for you to look which includes a bargains section. They stocks a huge selection of toppers, decoupage and other craft goodies, many of which you may have seen on QVC or Create and Craft TV. Foil Play lets you pick the individual designs of your choice, so you don’t need to invest in a huge kit and p&p is free on orders over £5.00”. Shell set us the theme of Christmas for this week and no sketch. So come on over and have a go the winner receives a £10.00 voucher to spend in the Foilplay store. Now there's an incentive. So onto my creation. I have this gorgeous little vintage image I downloaded (can't remember where from) and I used the colours from it for the papers which I found in some Christmas theme stacks. I have used stickles but NO DIs (wow can you believe that??) 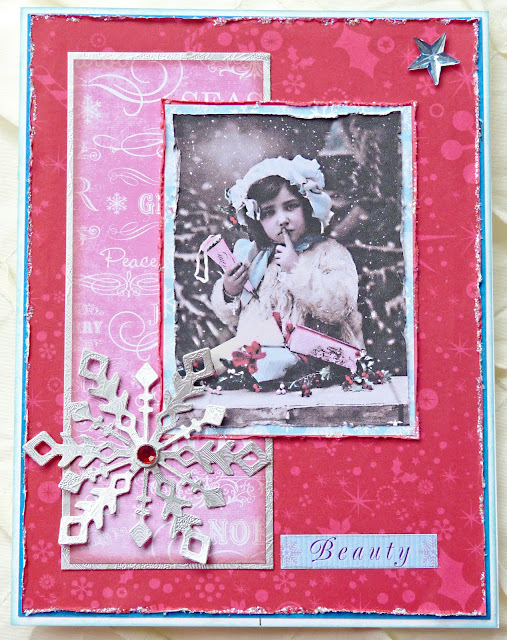 and I have used a Quickutz die to make the snowflake. I would love to know you have visited me so please leave a short message, I don't want you to take alot of time doing it 'cos we would all rather be getting inspiration and creating instead. Brenda, this is one of those cards that made me squeal when I clicked on it, its soooooo gorgeous. I love the sepia looking photogrphas, this really blows me away, its right up my street. I have just found some sepia photos of my grandmother dressed up, she was in an operatic society, and the clothes are very unusual, keep wondering how I can incorporate these into a card. Oh wow Brenda you have captured something special with this card that image along with the large snowflake and papers is wonderful.